The second full-length album from this Arabian oriental black metal band is out, just one year after their debut “Astfhl AlTha’r”. The band was formed only in 2008, but they are very active with four releases so far (including a mini cd and a split). There are some line-up changes in Al-Namrood, since they got a permanent drummer, but their vocalist left. So they are a trio again and they used Mardus as a guest vocalist. Those of you who have listened to the band, you should know what to expect from this album. They play raw underground folk black metal, with riffs based exclusively on oriental Arabian scales and many traditional oriental instruments (keys, not physical instruments). Compared to their previous works I see a big improvement on the sound of the guitars, while the addition of drummer enriched their sound. Synths sound also less “fake” and the samples of oriental instruments are much more natural. Their vocalist is very good and despite the fact he is not a full member, he fits perfectly with the band. The production in general is also much better, since everything is more clear and listenable, but it still definitely retains its underground feeling. The instruments are not merged into one sound and you can hear everything separately. I still believe though that the band can improve further their sound and they would make a big step forward if they tried to use real traditional instruments. Anyway the album is very good, with very interesting song ideas and a faster tempo, compared to the debut. Their eastern folk influences sound very refreshing, like the dark Arabian exotic atmosphere that penetrates both their music and lyrics. 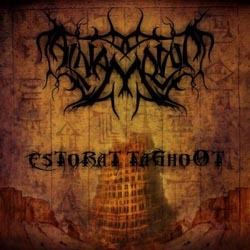 Overall Al-Namrood isn’t a group that fans of folk black metal should ignore, especially if you want something different and fresh. The band has a very characteristic sound and a great “unexplored field” to move (compared to the overcrowded Nordic scene), since it’s the only one from a land with a unique culture and history and a very special music tradition. Like their previous works it is released by the Canadian label Shaytan Productions. If they sound interesting to you, you can check them on the links below.